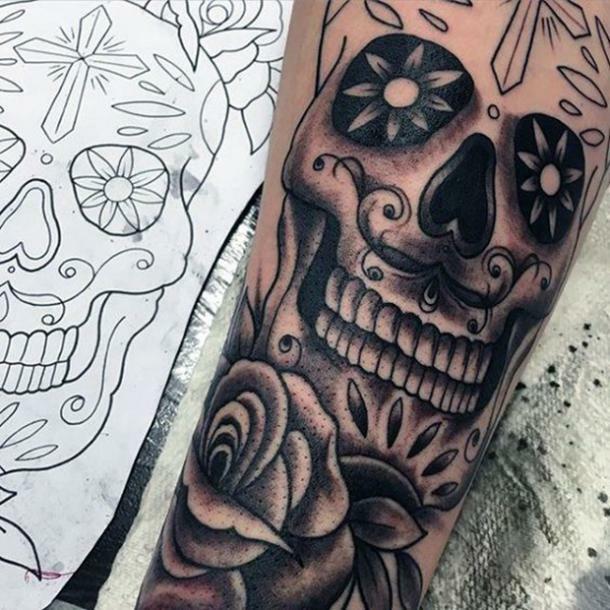 Day of the Dead is coming up, and it's the perfect time to celebrate with a sugar skull tattoo. Sugar skulls, also known as Calaveras, are decorative representations of human skulls that are typically associated with Día de los Muertos, or Day of the Dead. There’s a lot of talk of Halloween — which Halloween costumes would be best, how to decorate for Fall, getting ready for the Thanksgiving and Christmas holidays — but not much of Día de los Muertos, which is celebrated from October 31st to November 2nd. The Mexican holiday is meant to honor and remember deceased family members. Unlike Halloween, which is ‘dark and scary,’ Day of the Dead involves music, dancing, parades and delicious feasts. Decorations feature vibrant colors, flowers, candles and, of course, sugar skulls. The holiday’s history began among ancient Mexican cultures such as the Aztec, Toltec and Nahua peoples. These cultures believed that mourning lost loved ones was disrespectful. Death is a natural part of life’s process, and the dead members of the community should be kept alive in spirit and memory. In fact, these cultures believed that the spirits of the dead returned to Earth during the Day of the Dead celebrations. To this day, Mexican people build altars to honor their dead friends and family to welcome them back home during the festivities. They offer food and beloved items, which are featured on the altars, also known as 'ofrendas'. The sugar skull, or Cavalera, came about after the Spanish conquest of Mexico. They brought the idea of creating decorations from cheaply-available ingredients. There was an abundance of sugar, thus prompting people to mix sugar and water to create a moldable material. Sugar skulls are traditionally colorful and made of this sugar mixture and featured on Día de los Muertos altars. However, with more available materials today, sugar skulls can be formed with chocolate or other, more expensive ingredients. 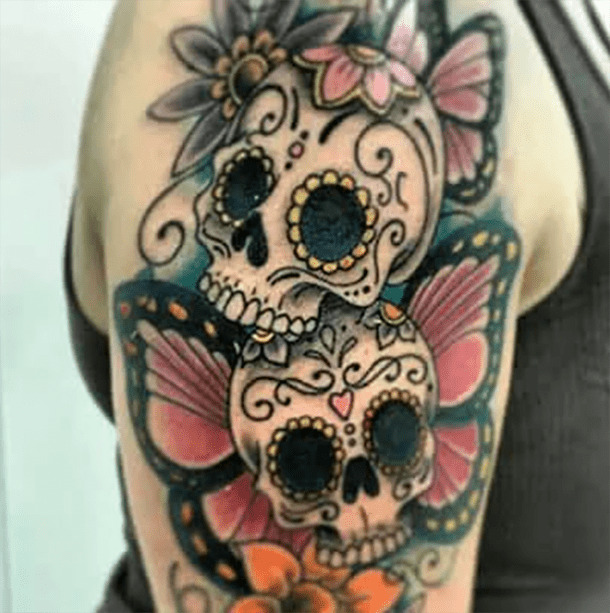 The meanings and symbolism behind the Day of the Dead have inspired many and prompted the popularity of sugar skull tattoos. Oftentimes, they are used much like the real sugar skulls: to honor a deceased loved one. However, they can also represent the idea of eternal life and spirit. 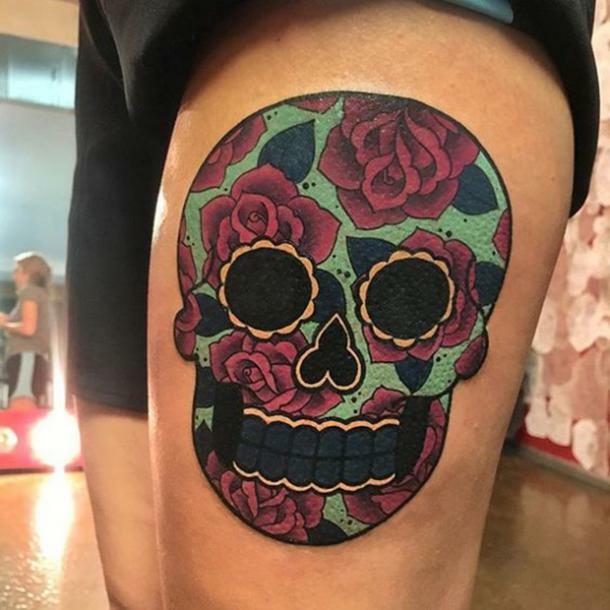 Here are 49 of our picks of the best sugar skull tattoo ideas to inspire your next piece of bodily artwork. 1. 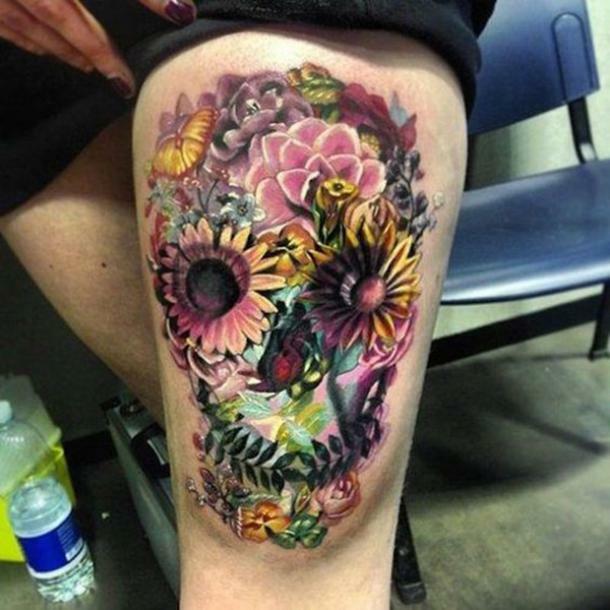 A sugar skull-inspired floral tattoo. While this one isn't a skull per se (it's more of a floral arrangement that LOOKS like a skull), the colors give it a Día de los Muertos vibe. 2. 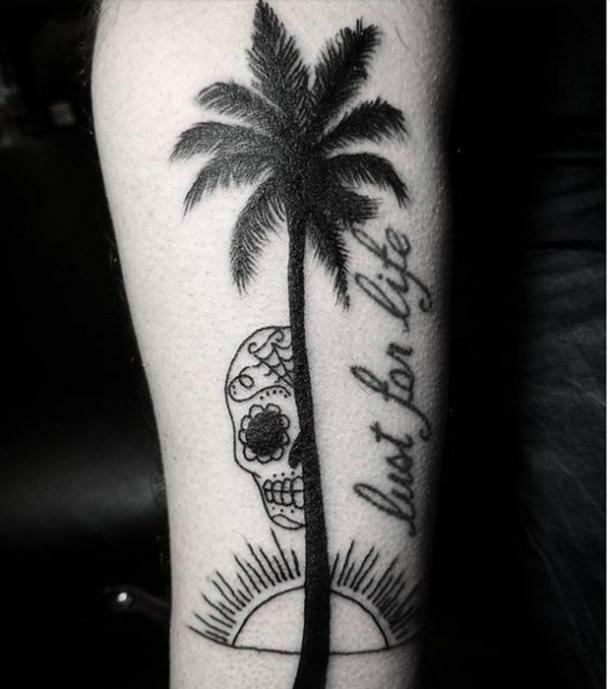 A simple yet elegant black and white tattoo design. This one is three-dimensional and very realistic. Just look at those teeth! 3. 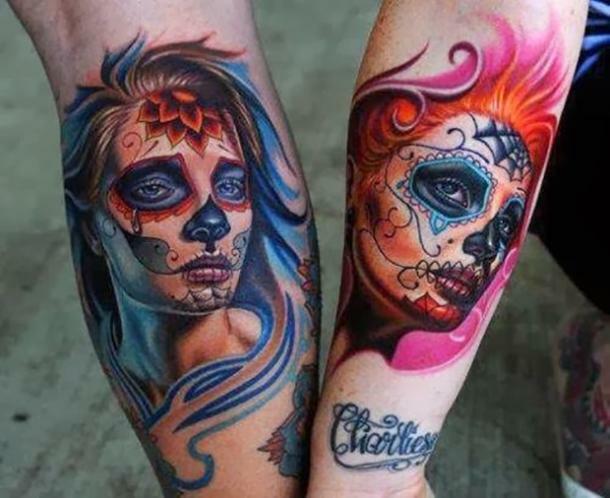 Matching sugar skull tattoos for you and your bestie. You can make them slightly different from each other by adjusting the colors. 4. 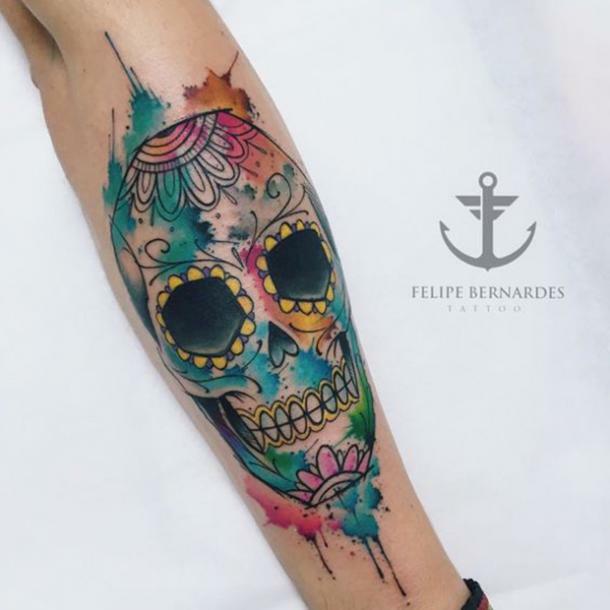 A subtle sugar skull tattoo within a colorful, natural design. This is a sugar skull that isn't really a sugar skull; the flowers, patterns and bird are placed to make the colorful shape of a skull. 5. One for the artist inspired by Freida Kahlo. Frieda Kahlo was a Mexican artist known primarily for her stunning self-portraits featuring her trademark unibrow. 6. 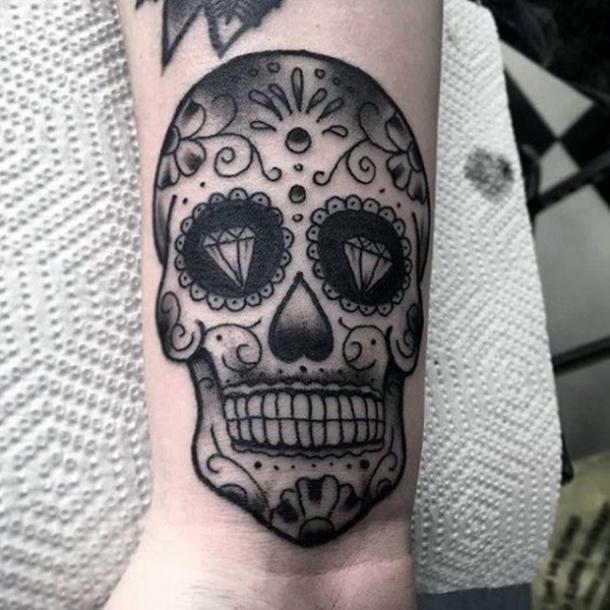 A diamond-eyed unisex tattoo design. Some people prefer black and white tattoos only, and that's okay. 7. 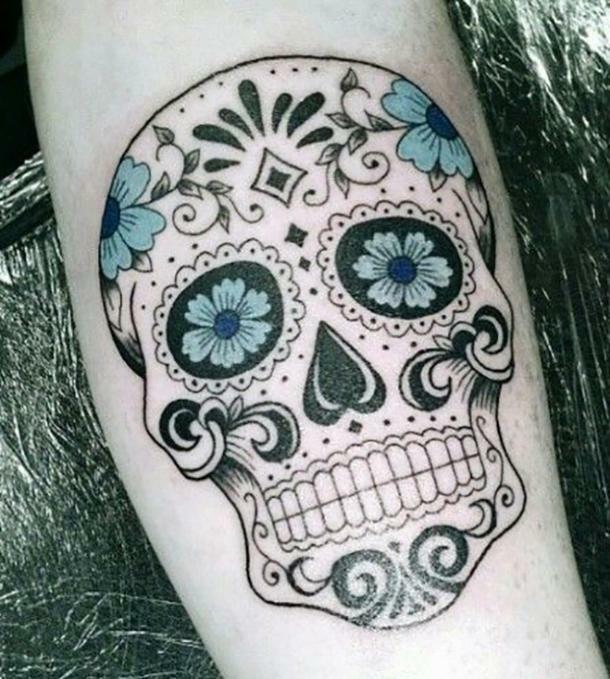 A black and white tattoo design with a pop of blue. Like the color but not too much of it? Pick just one for a few of the details. 8. They can be realistic and classy. 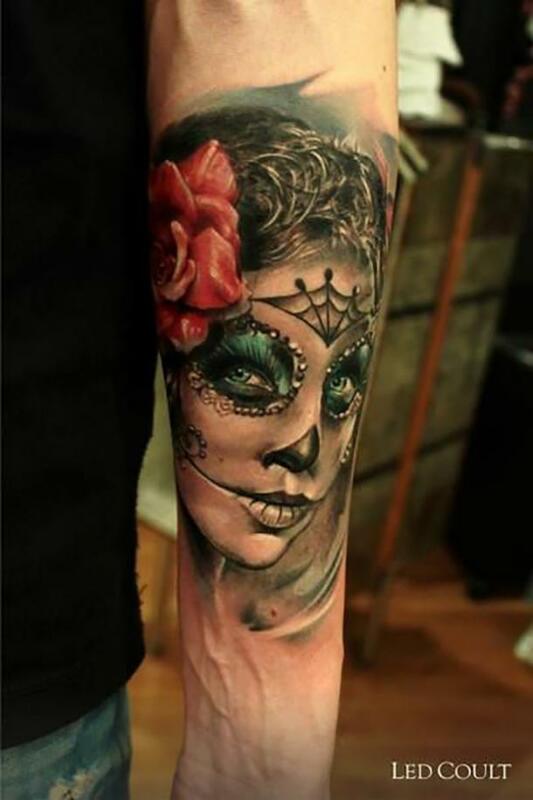 Realistic portraits can feature sugar skull details, too. 9. Or keep it simple yet positive. 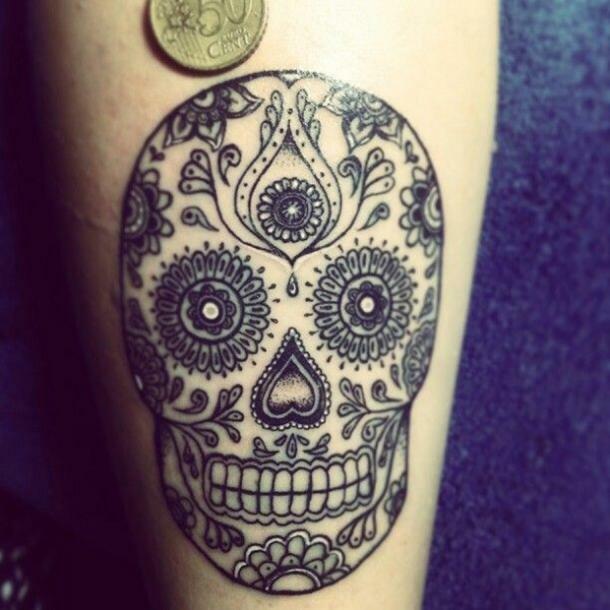 Although this sugar skull tattoo doesn't have an excess amount of detail, its message is clear. 10. 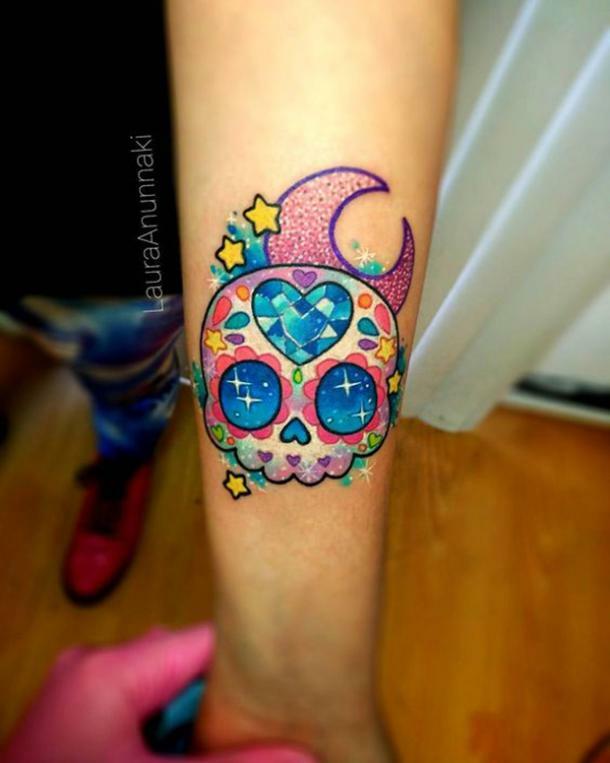 Sugar skull tattoos don't need to be dark; they can also be cute, colorful or sparkly (or all three). This one is giving off a Lisa Frank vibe and we're here for it. 11. 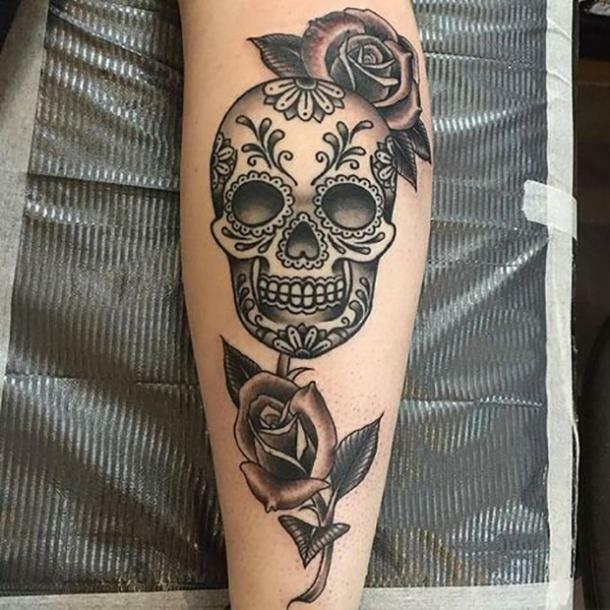 Incorporating roses into your skull tattoo adds some extra flair. 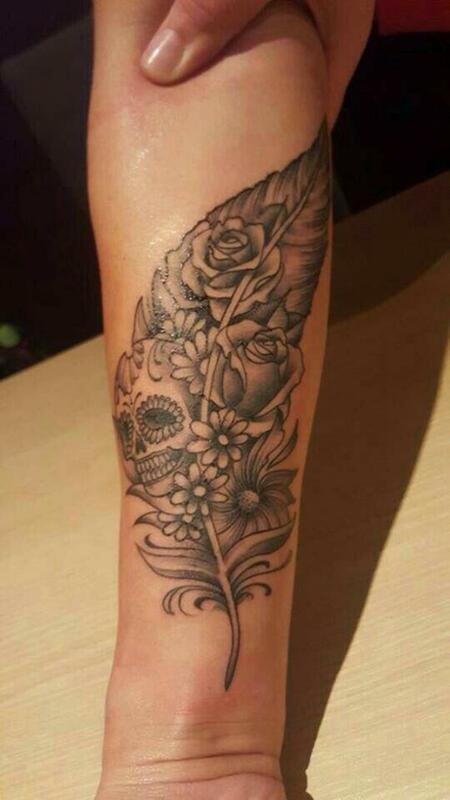 A single stem of roses elongates the tattoo. Perfect for a let or arm piece! 12. Butterflies have the same effect if that's your thing. Butterfly tattoos may have been much more popular 10-15 years ago, but the butterfly symbolizes transformation and life after death, so it's fitting. 13. 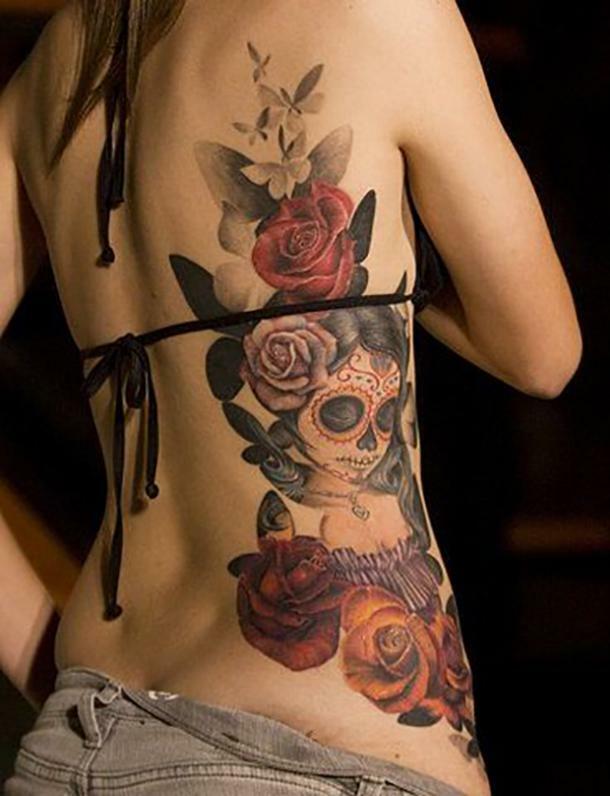 Sugar skulls look nice in the neo-traditional tattoo style. Traditional tattoos never go out of style. 14. Or with a Dali-esque mustache. Salvador Dali was a Spanish surrealist artist with a distinctively whimsical mustache. 15. You can use vibrant touches of color to brighten your tattoo up a bit. 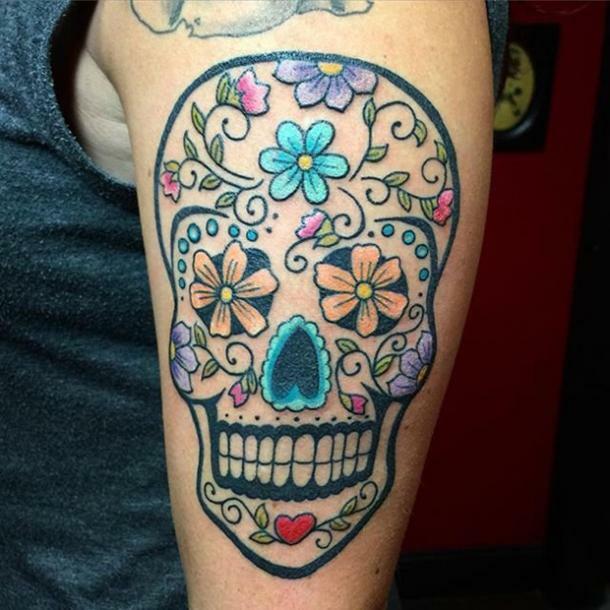 Without being completely colored-in, this sugar skull is fun and vibrant. Flowers work nicely as a frame for the skull. 17. 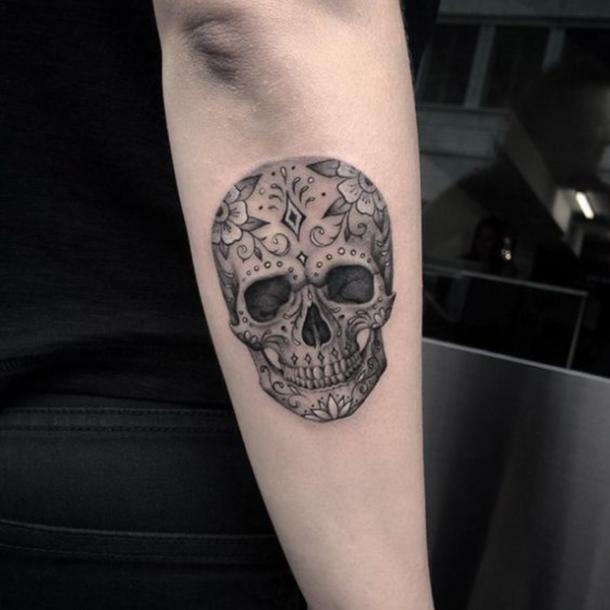 A sugar skull tattoo fits nicely onto a shoulder. 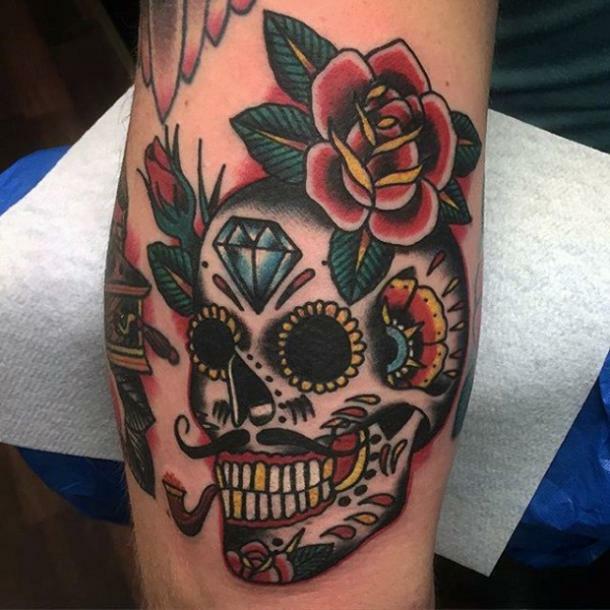 This traditional and colorful piece is certainly a conversation-starter. 18. Subtle colors look just as nice as bright. The pastel colors in this tattoo are subtle but exciting. 19. Did I mention detail? 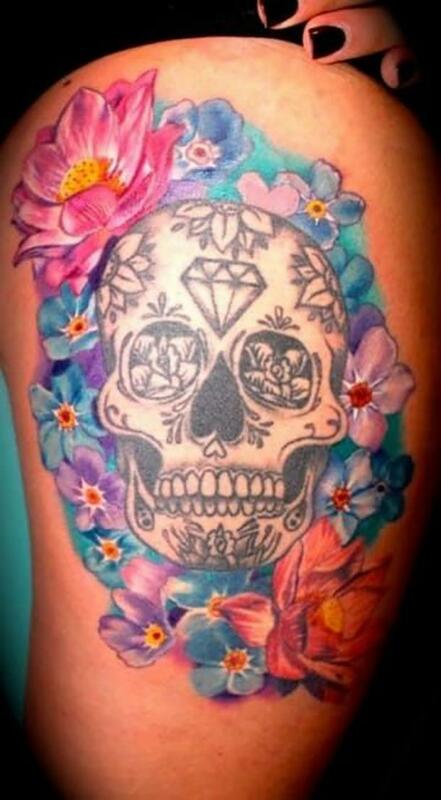 The white details on this sugar skull make it pop without explicitly using bright colors. 20. A sugar skull tattoo pairing for you and your most-committed friend. Realistic portrait tattoos can be extremely expensive, but if they're done correctly, they're definitely worth the cost. You can even get an uncanny portrait of someone you know. 21. 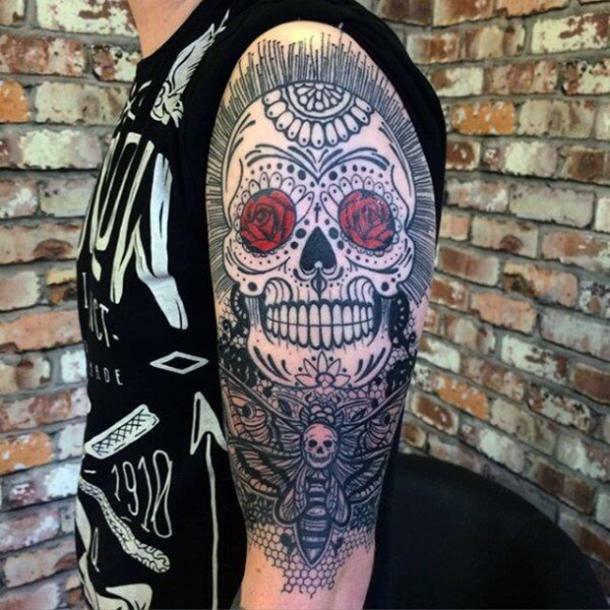 Intricate line work around the skull tattoo makes it the focal point of a larger piece. 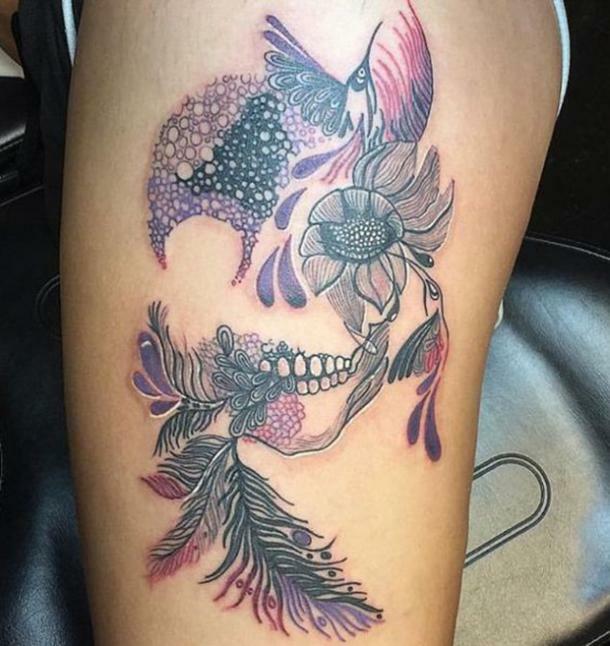 This tattoo features lots of incorporated patterns, and the moth frames the skull nicely. 22. A non-traditional tattoo approach signifying growth and healing after death. 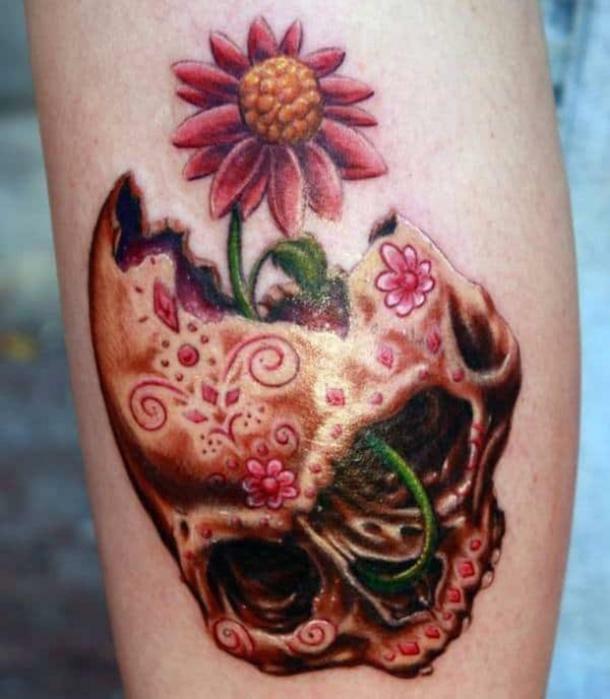 While it's common to incorporate flowers into sugar skull tattoos, this one puts a creative spin on the idea by having the flower grow out of the (realistic) skull. 23. If small tattoo is more your taste, go for tiny and black. Black work is underrated in tattoos, TBH. 24. ...Or cute and quarter-sized. Want a tattoo but aren't willing to commit to the pain and cost of a big piece? Small and simple saves you time and money. 25. Feather tattoos are pretty popular. 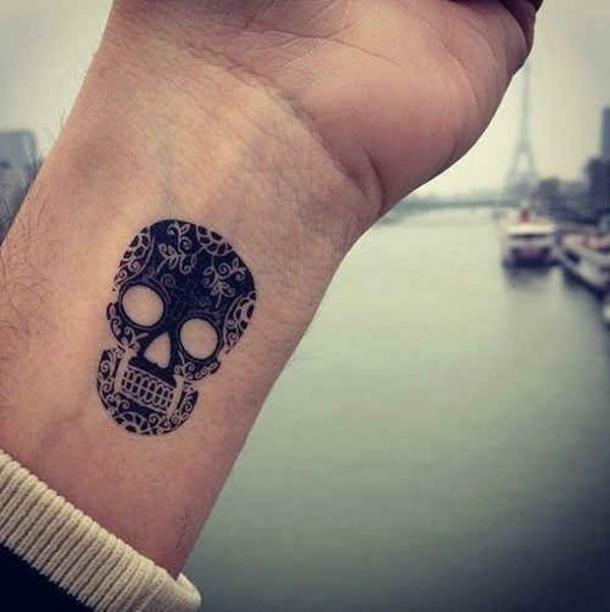 Make yours unique by incorporating a sugar skull. 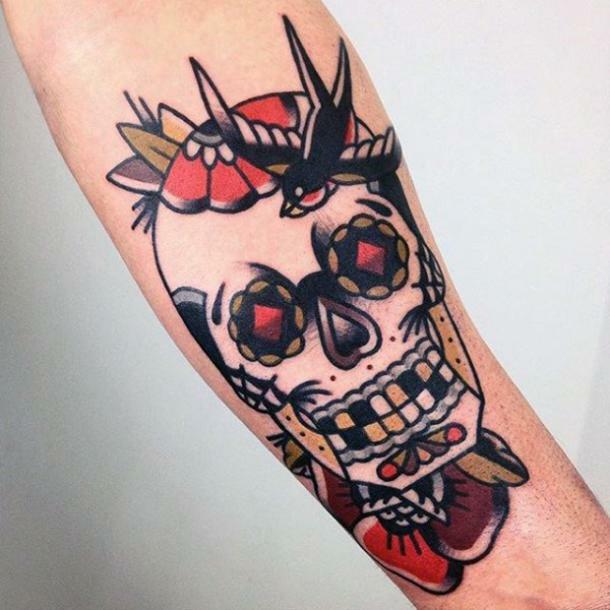 Some cultures see feathers as symbols from the spirit world, so it's actually fitting to put one with a sugar skull. 26. 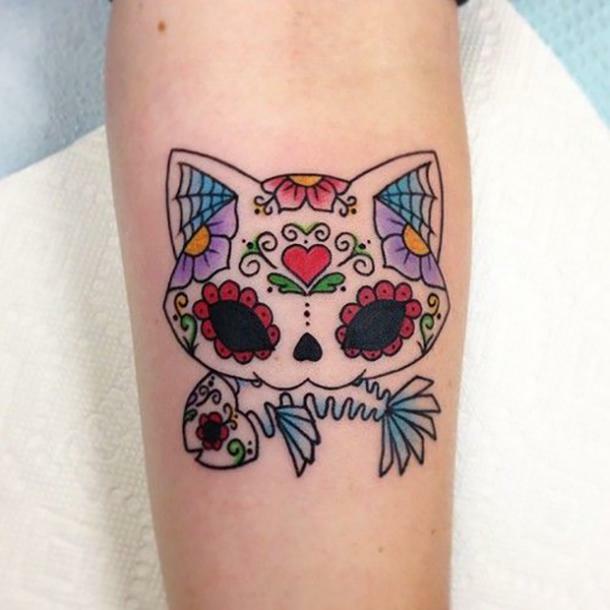 This one is for the cat-lover who celebrates Day of the Dead. Who said sugar skulls needed to be human? 27. A unique alternative to color is pointillism in a tattoo. Dot work adds the illusion of shadow without using shading or color. 28. 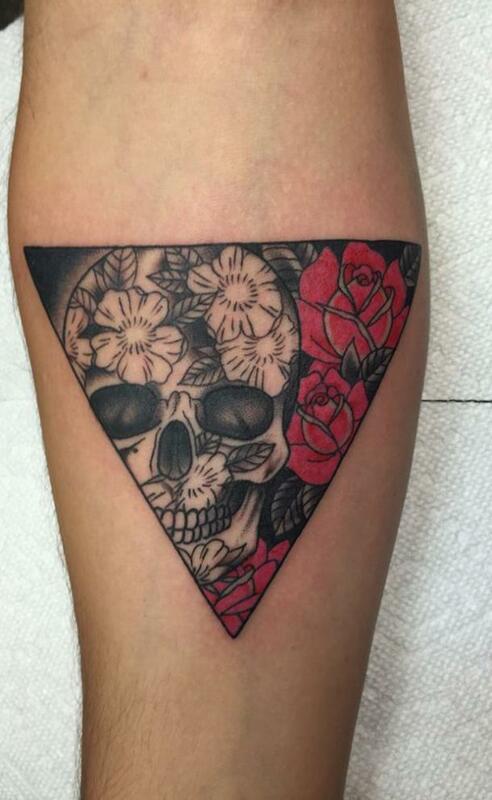 This one features the sugar skull inside of a triangle tattoo. Triangle tattoos are popular. Their meanings include the Holy Trinity or, in Greek symbolism, higher wisdom. 29. 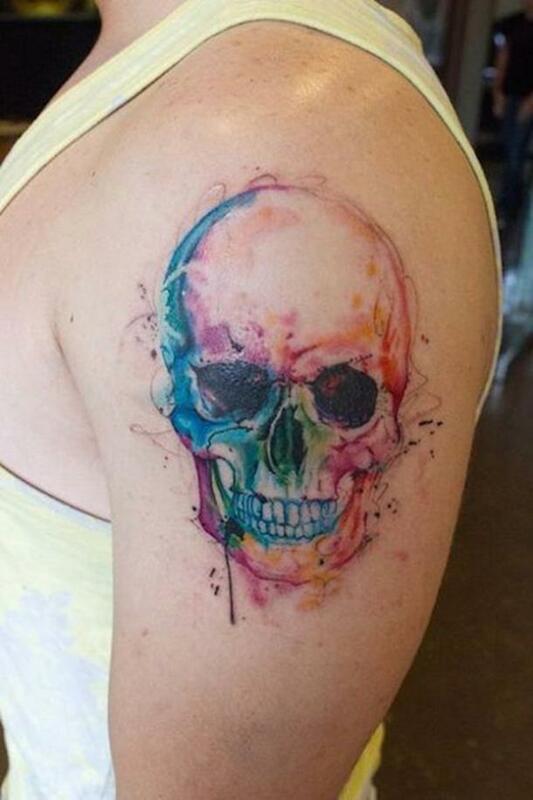 One unique way to add color is to use a watercolor style tattoo. This one features no black line work, and the colors blend well. 30. 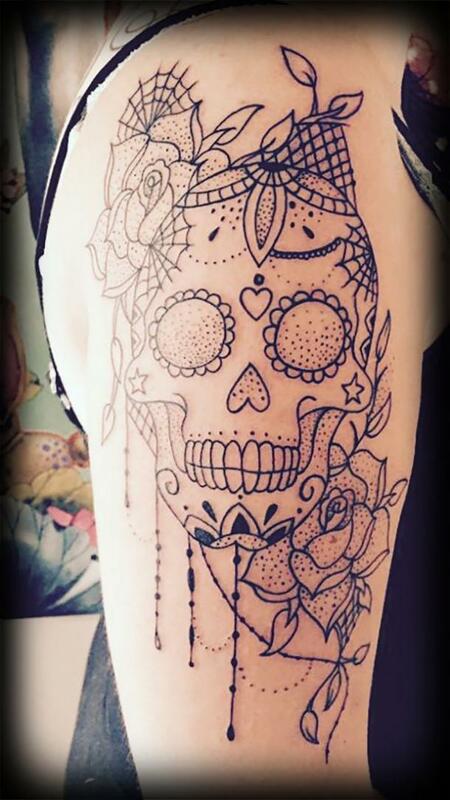 Give the sugar skull tattoo class by making it look like black lace. If you're going for a noir aesthetic, this is a great option. 31. 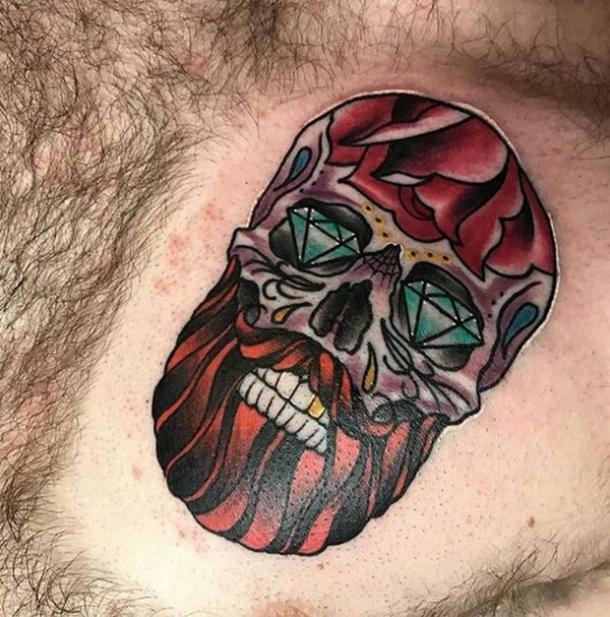 If you're ultra-committed, large tattoos aren't a bad investment. This girl really got her money's worth. Those roses are gorgeous! 32. 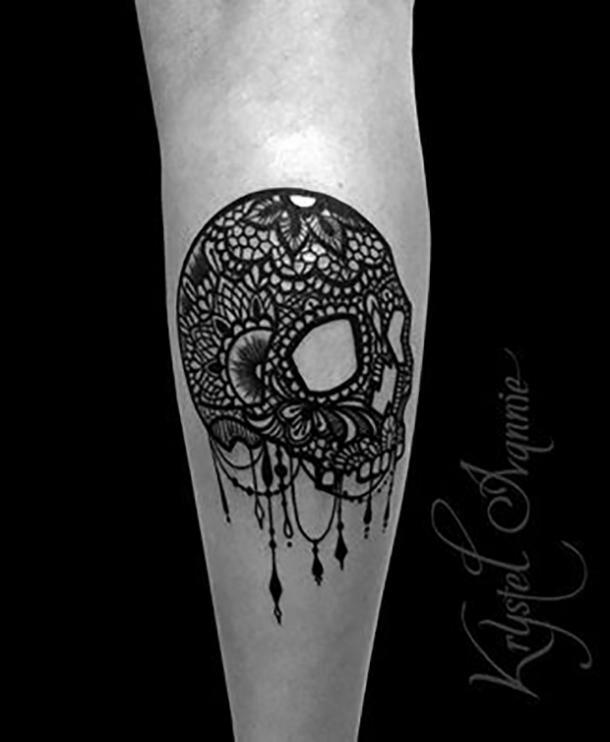 A patterned skull tattoo is nice to look at. You can find inspiration in wallpapers and fabrics. 33. This one is for the dog lovers. 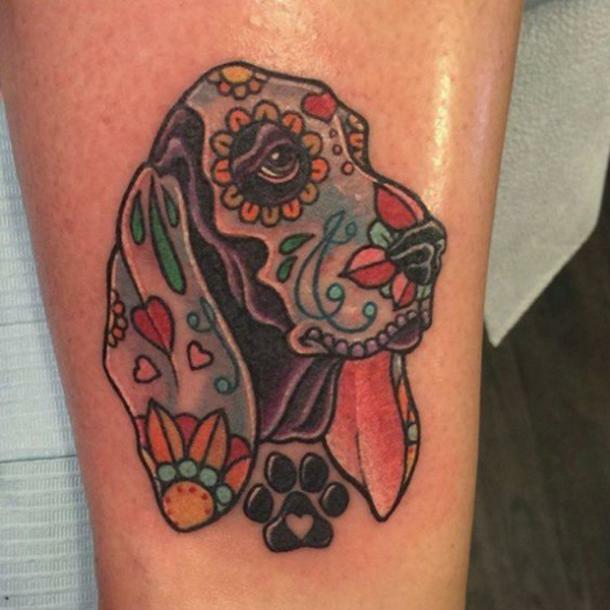 If you've lost a special pup in your life, honor his memory by getting a sugar skull portrait tattoo. 34. 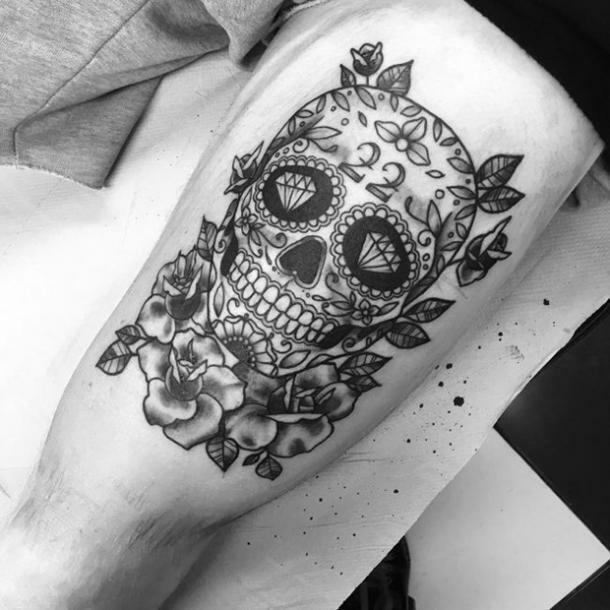 Another black and white sugar skull tattoo with some impressive shading. The shading adds depth and dimension to the piece. 35. You can find tattoo inspiration in your favorite Disney characters. 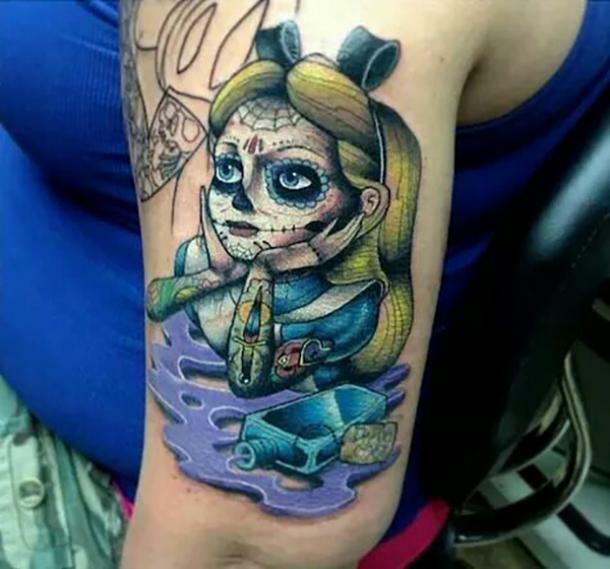 Alice in Wonderland tattoo pulls off the sugar skull look. 36. You don't see many on this list, but a skull profile puts a twist (literally!) on a popular design. This one features the skull's hair and floral headpiece. 37. 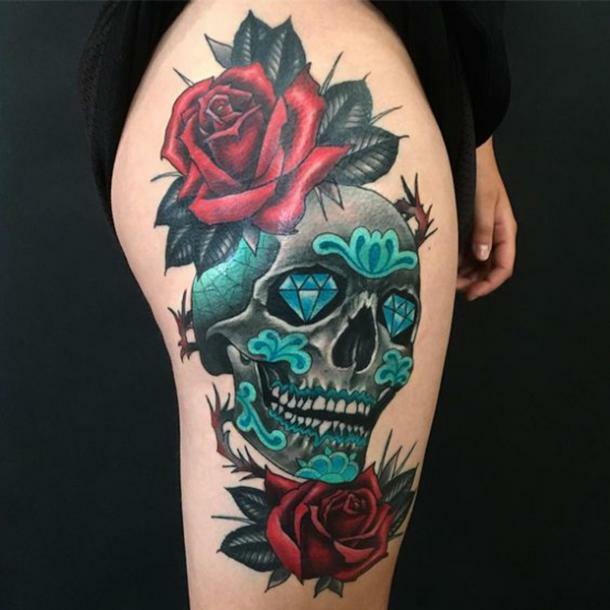 While sugar skull tattoos are often colorful, sometimes one featured color looks nice, too. The gray shading surrounding the bright blue allows the color to pop. 38. 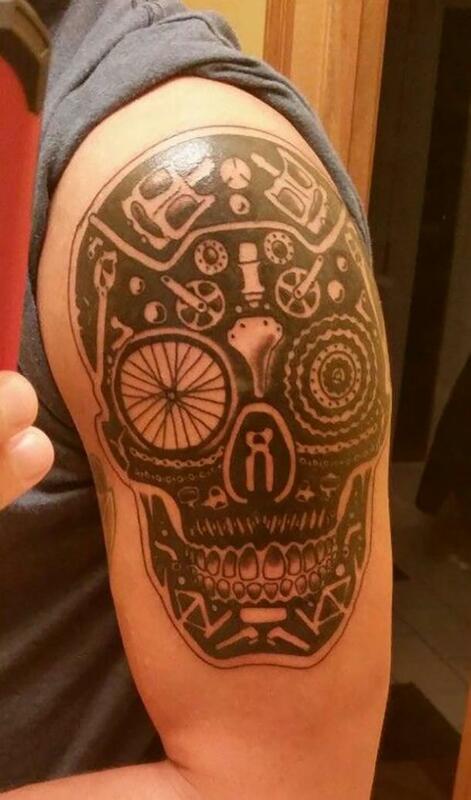 This "sugar skull" is inspired by bicycle parts. 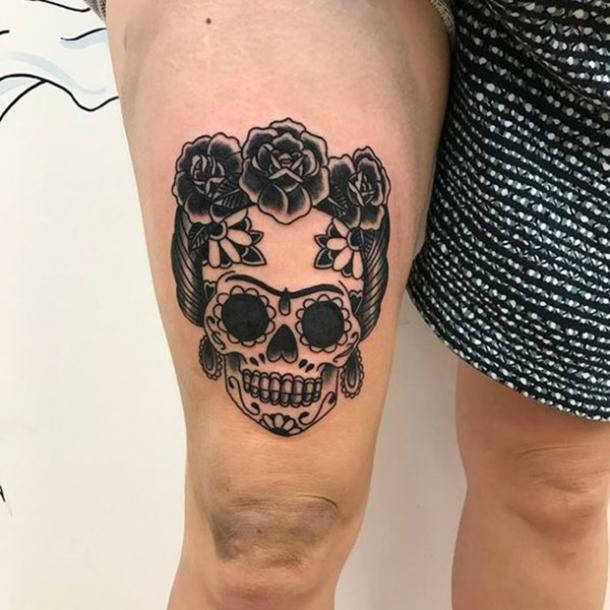 At first glance, it's a sugar skull. Look closer and you can find gears and bicycle wheels. 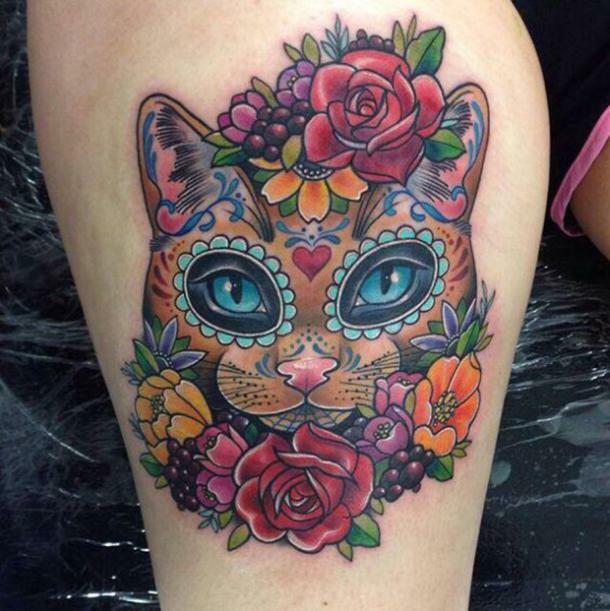 Combining multiple interests in one tattoo makes it one-of-a-kind! 39. Another one for the cat lovers. This one is especially cute and cartoony. The fish skull is pretty creative, too! 40. 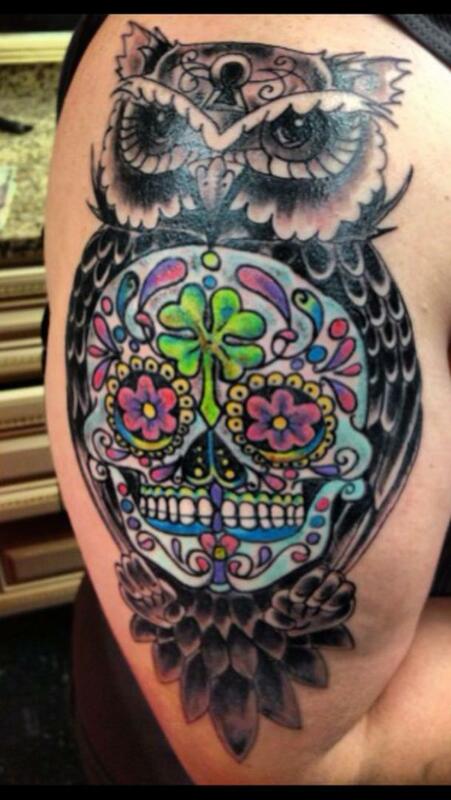 This sugar skull tattoo is featured on the breast of an owl. 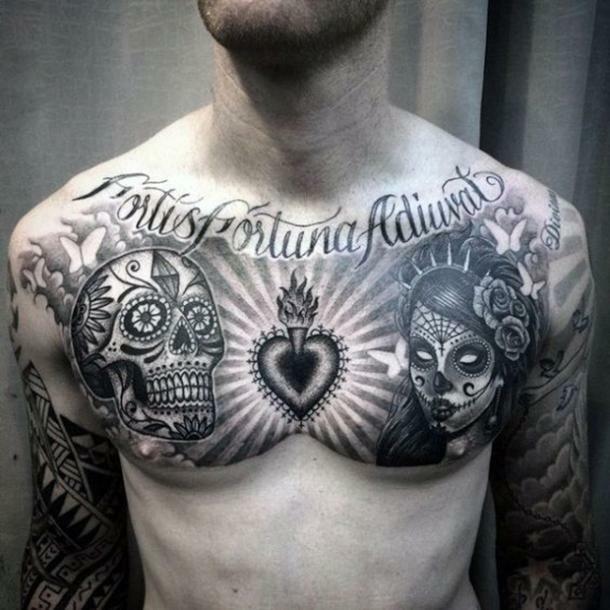 It's another case of a combination of interests that resulted in a stunning piece of body art. 41. This one's for the manly man. 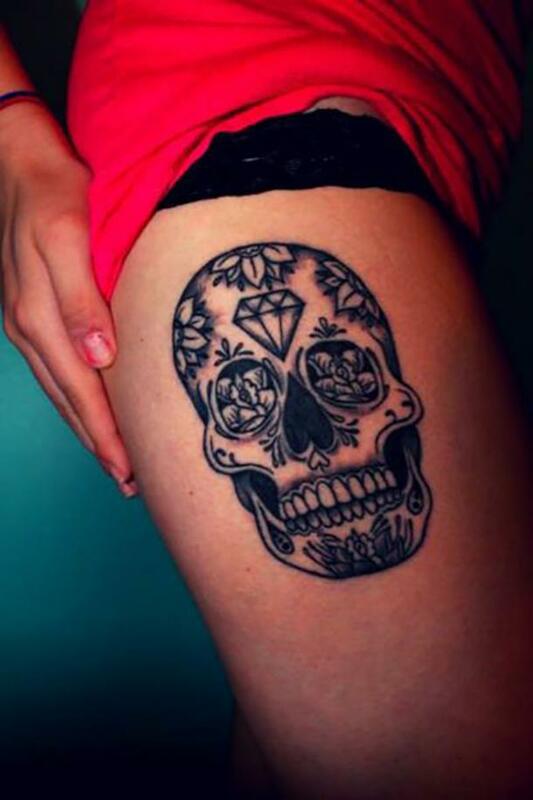 Want a sugar skull tattoo but don't want it to seem too feminine? Give it facial hair! 42. Or, you can express its masculinity by making it especially dark. While black and white tattoos look good on everyone, lots of shadows give it a dark vibe that fits with the death aesthetic. 43. If you're going for symmetry, get two sugar skulls at once. They can be inspired by a couple in your life (deceased grandparents, perhaps), or just symbolic. 44. 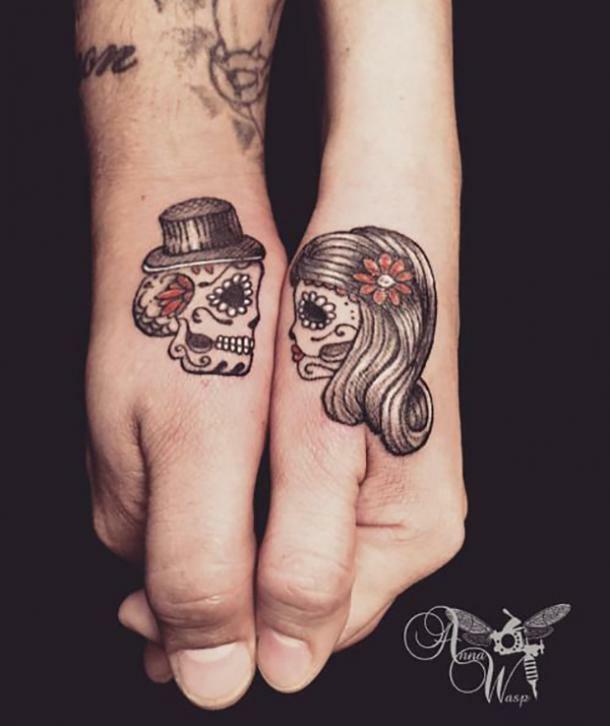 If you and your significant other feel inspired by Day of the Dead tattoo (and are committed to each other), you can get couple's tattoos. 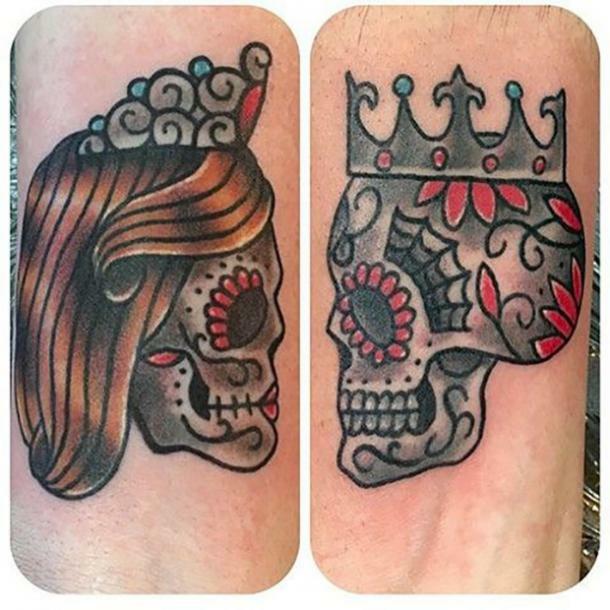 This couple opted for a royal spin on their sugar skull tattoos. 45. 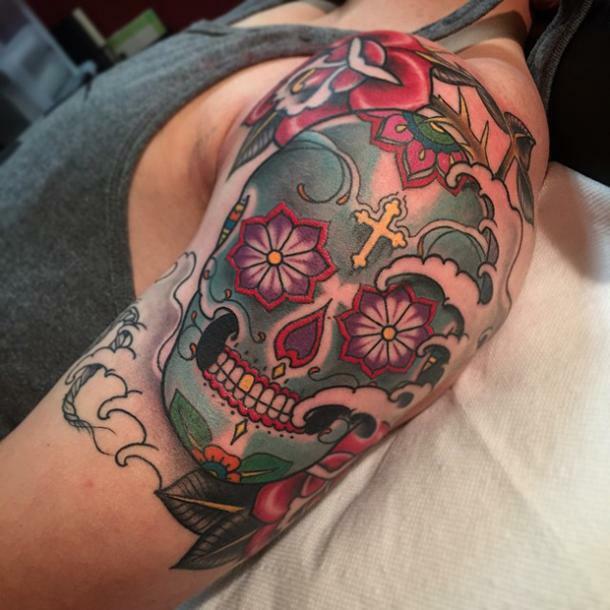 Putting colorful art around a black and white sugar skull features both the flowers and the darkness of the skull. It sticks with both the tradition of vibrant colors and the symbolism of death. 46. 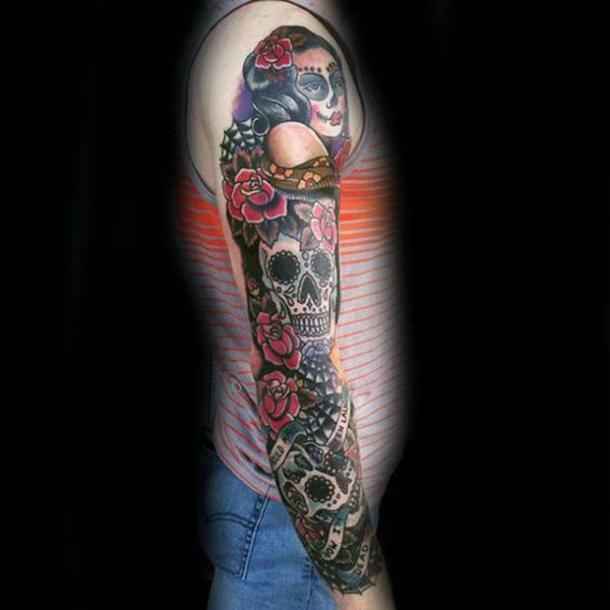 You can fit multiple sugar skulls in one full sleeve tattoo. This one features three sugar skulls with plenty of extra flair. 47. 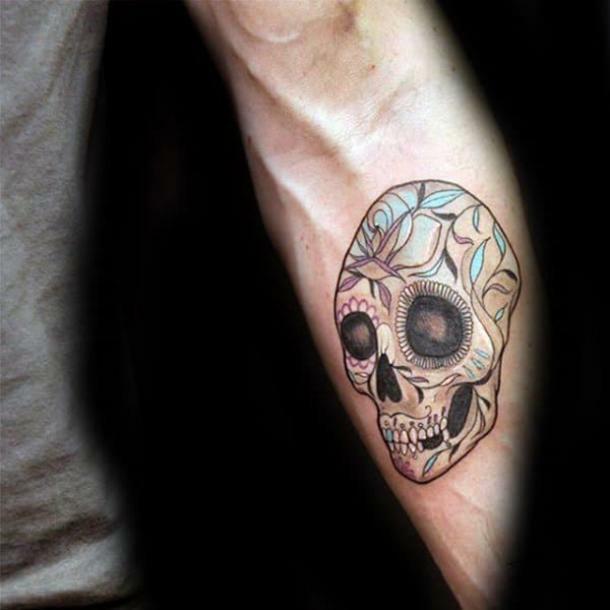 Another sugar skull tattoo featuring watercolor. Unlike the first, this one has some black line work that makes it look like a sketch. 48. 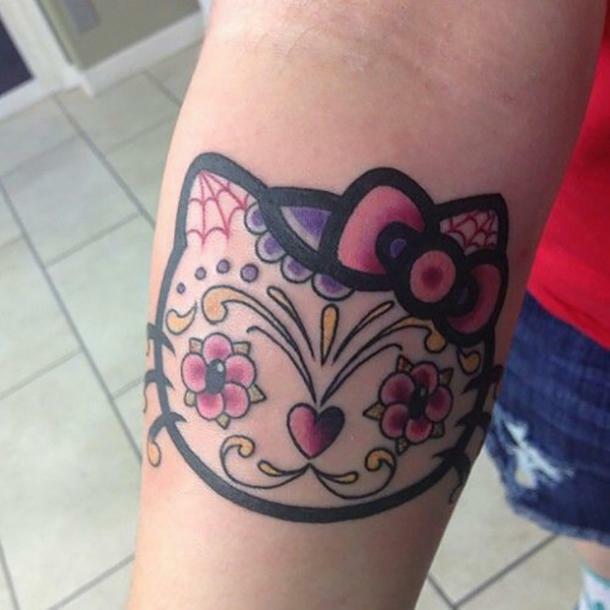 One for the Hello Kitty tattoo fan. Combining a sugar skull look with a favorite character gives you an unusual piece that people will notice. 49. 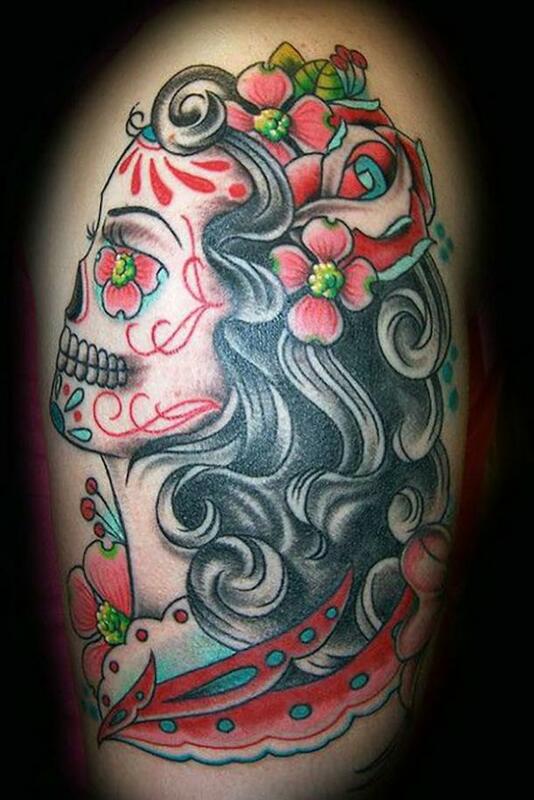 Here's a more feminine tattoo sleeve inspired by sugar skulls. While this sleeve only features one sugar skull, it leaves plenty of space for flowers and words. 50. 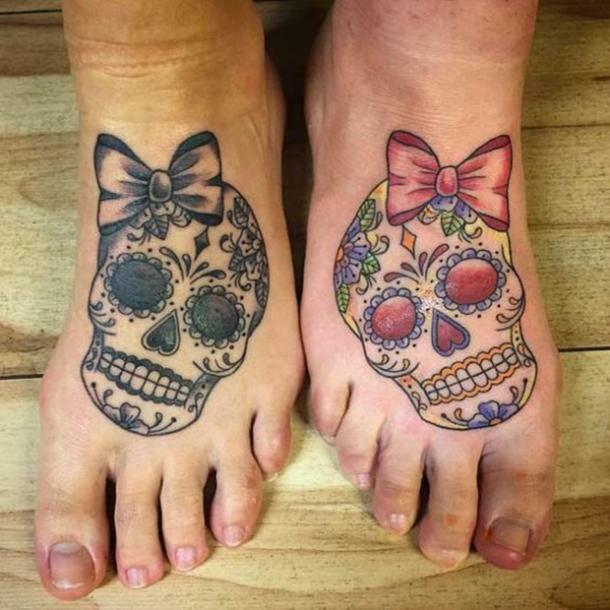 A his and hers matching tattoo of sugar skulls. 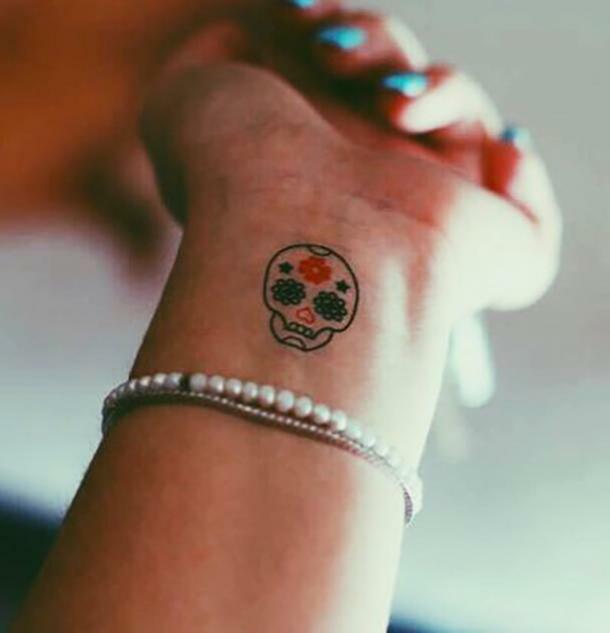 While these sugar skull tattoos are small and minimalist, they are a great way to remember someone you both love.